Walking and tasting in Europe's highest region. Fill your senses with the pleasures of Europe's highest mountains. Heart of the Italian Alps is a self-guided walking and tasting itinerary in the Valle d'Aosta, North West Italy. Heart of the Italian Alps can be enjoyed in the different ways listed below. Relax and recharge as you pass through Alpine pastures, raging rivers, vineyards, orchards, Roman architecture, picture-postcard villages and fine accommodation. This price includes airport transfers (Turin Airport only). 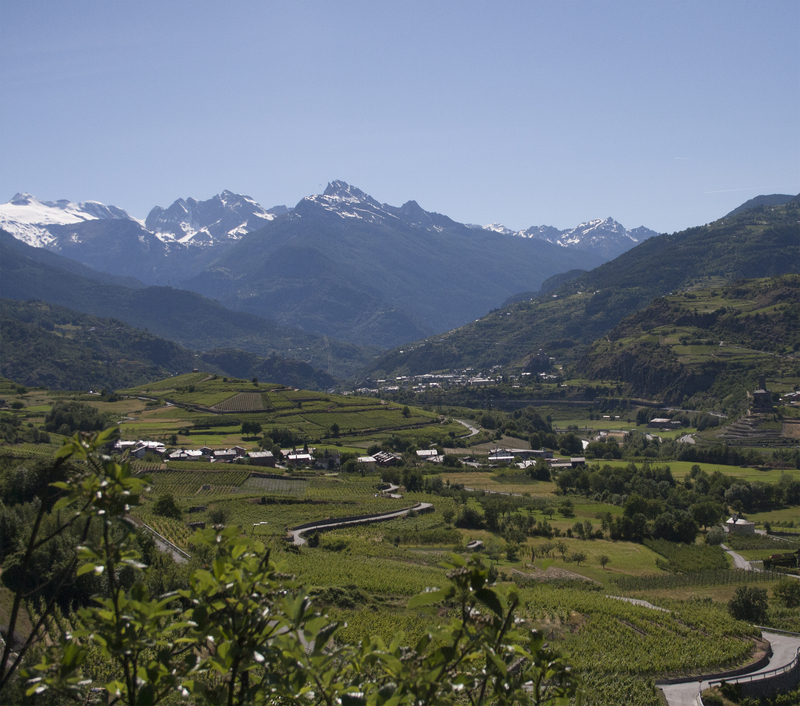 This trip is single-base • Stay at a beautifully appointed Chambres d’Hôtes inside the historic walls of Roman Aosta • 23km all-day circular walk taking in villages, vineyards, orchards and a unique morenic côte. Important: it is essential that your return flight from Turin departs 5pm or later. This trip is twin-base • Two nights at the Chambres d’hôtes in Aosta and two nights (one of which half-board) at a five-star resort with views of Monte Bianco. Local Manager transfer to the start of the second walk is included in the price. The third walk winds through Europe’s highest vineyards and then alongside the rushing Dora Baltea river to Courmayeur. Transfer back to the hotel. That evening relax at the thermal baths. Board Skyway Monte Bianco the following morning and depart in the early afternoon. This trip is three-base • All details as above EXCEPT one night half-board at the five-star resort, then two nights b&b in a characteristic hotel in chic Courmayeur. Your final full day takes in Skyway and the thermal baths. 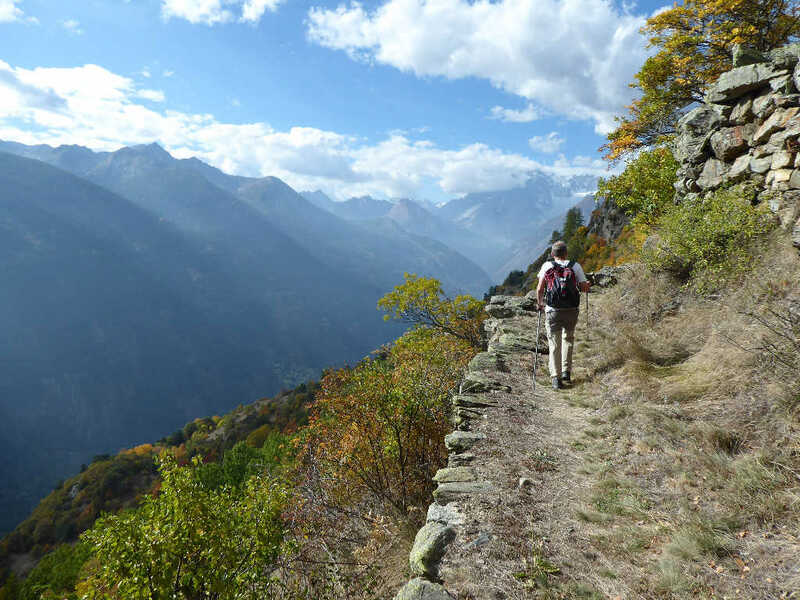 This trip is a five-base walk following a continuous trail • Night one at the Chambres d’hôtes in Aosta then your second night half-board at a sommelier-owned hotel in the heart of Aosta’s wine country. Walk behind a waterfall and over an ancient Roman bridge spanning a deep gorge. Night three half-board in an agriturismo (working farm). Walk to the five-star resort where your first night is half-board. Relax for a well-earned rest day enjoying the pool, jacuzzi, bar and restaurant, and explore the pretty local village. Dinner in the village or at the hotel (pay locally). The final walk takes you to Courmayeur where two nights in characteristic b&b accommodation in a hotel in the town centre. Your final full day will take in Skyway and the thermal baths. "...the walks were delightful, challenging at times with stunning views at almost every turn, the towering magnificence of Mont Blanc always there in the distance guiding me toward my eventual destination of Courmayeur..."
Our own publication of background information, travel tips, maps and walking instructions written to 10 metre accuracy. B&B or Half-Board accommodation as indicated. and at Cave Mont Blanc’s experimental high-altitude winery - halfway up Monte Bianco! 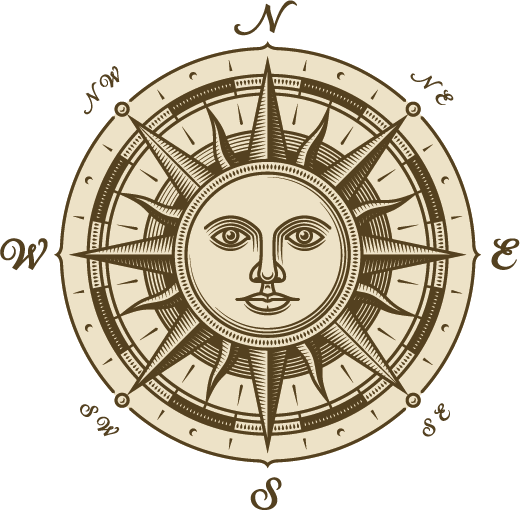 Order forms - we stock many of these wines and can have them ready for your return. A return pass for both sections of Skyway Monte Bianco. Typical Valdostano three-course lunch at Ristorante Bellevue 2,500m. A full day or evening ticket (according to the chosen itinerary) to the luxurious thermal baths at Pré-St.-Didier. Meet our Local Manager before you begin - they will give you their mobile number and be on call for assistance or advice for the duration of your stay. Your bags moved ahead of you (multi-base trips). Flights - we recommend Torino Caselle (BA fly here from London Gatwick). Airport transfers except where specified. Transfers within the trip can be organised for you but must be paid for locally.